ALICE GRIFFIN was born 16 May 1858 in St Olave, in Horsleydown, Surrey, London. Alice aged 12 yrs travelled with her parents Ebenezer and Mary Ann Griffin and family to Taranaki on the ship Mataura arriving at New Plymouth 11th Nov 1875. Alice died Nov 1938 in Woollara, New South Wales aged 80 vears. Thursday 20 October 1938: WOODGER.-The Funeral of the late ALICE WOODGER late of 1 View Street. Woollahra will leave the Kinsela Chapels. Oxford St. Taylor Square. Darlinghurst, THIS THURSDAY after service commencing at 10.30 a.m.. for the Crematorium. Eastern Suburbs. Diversification of Stock: 1879 Evening Post, 31 October 1879, WANTED Known— For Sale, Feathers any quantity, at Woodger and Duff's, Fruiterers, Molesworth-street. Their essential carrier of goods went walk-about 25 February 1880: Advertisement: STRAYED, from Wadestown, one Grey Pony Mare, shod with leather on fore feet. Anyone returning same to Woodger and Duff, Molesworth-street, will be rewarded. 1880 MARRIAGE. Woodger - Griffin: On the 29th March, at the residence of J. Moir, Richard Arthur Woodger, to Alice Griffin, both of Wellington. Taranaki papers please copy. The month following their marriage Richard announced - "THE PARTNERSHIP hitherto existing between us, the undersigned, as Greengrocers, &c, has been DISSOLVED by mutual consent. All accounts due to or owing by the said partnership will be settled by R. A. Woodger, who will carry on the business as usual. Signed, R. A. WOODGER, W. O. DUFF. Witness, S. Bethell. 6th April 1880". 1880 Evening Post, 9 October, "By Special Appointment to His Excellency the Governor. R. A. WOODGER, FRUITERER, GREENGROCER, AND POULTERER, MOLESWORTH-STREET, WELLINGTON, Has Removed to more convenient premises, lately occupied by Mr. J. Fear. The Grocery, Bread, and Biscuit Trade will be carried on as usual in connection with the above." and the following month the paper stated in general news: "Mr. R. A. Woodger, greengrocer, &c, of Molesworth-street, has shown us a quantity of tomatoes, which, considering the season of the year, are of a really splendid description, being fine, large, and ripe. However, business was tough and his timing led to financial difficulties and Richard found he was unable to meet his debts. IN BANKRUPTCY. IN THE SUPREME COURT OF NEW ZEALAND. WELLINGTON DISTRICT. ? In the matter of the"The Debtors and Creditors Act/ 1876," and the amendments thereof ; And In the matter of the Bankruptcy of RICHARD ARTHUR WOODGER, of the City of Wellington, Fruiterer, a Debtor. THIS is to notify that RICHARD ARTHUR WOODGER, of Wellington, Fruiterer, has this day filed a statement that he is unable to meet his engagements with his creditors, The first meeting of creditors will be held at the Supreme Court House, Wellington, on Monday, the thirty- first day of January, 1881, at 10.30 o'clock in the forenoon. Dated at Wellington this 25th day of January, 1881. HENEY HALL, Deputy Registrar. Buller and Gully, Solicitors for the said Debtor. 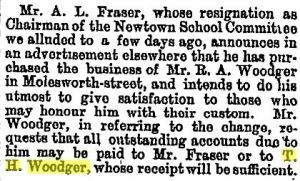 Accounts were asked for 1881: Evening Post 9 February 1881: In the matter of " The Debtors and Creditors Act, 1876," and the amendments thereof; And Of the Bankruptcy of RICHARD ARTHUR WOODGER, of Wellington, Greengrocer. I HAVE to request that all Claims against the above estate shall be sent in to me not later than Saturday, the 19th instant, otherwise they will be excluded from the dividend about to be declared. GEO. BESLEY, Trnstee in the estate of the said R. A. Woodger. Richard's debts were disposed of and he reopened for business in April 1881 - OYSTERS ! OYSTERS ! ! OYSTERS ! ! ! R A. WOODGER, the only importer of the celebrated Whangerei Oysters, has just received a supply. Evening Parties attended on. Address - R. A. WOODGER, Wholesale and Retail Fruiterer, Greengrocer, and Poulterer. MOLESWORTH-STBEET, Next to the Wellington Hotel. Oct. 1883 GREEN PEAS. GREEN PEAS. New Potatoes (Hutt grown) Gooseberries Rhubarb (Canterbury) Cucumbers Asparagus R. A. WOODGER, Molesworth-Street. August 1884 POULTRY. POULTRY. WANTED to buy, young Fowls, Ducks and Turkeys, in any quantity ; highest cash price. R. A. Woodger, Poulterer, Molesworth-street. Richard was one of a deputation to Mr Larnach to urge the removal of the restrictions upon the importation of grapes from Australia - the minister was told that the grapes grown in that country were superior to hot-house grapes grown here, and could be sold for 1s per lb., whereas New Zealand grapes could not now be sold in Wellington under 4s per lb. The price in Christchurch was 3s 0d, and in Auckland 3s. 22 June 1889 - NOTICE. 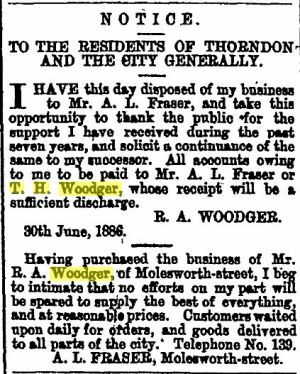 I HAVE sold my Seed Business (branch shop) in Cuba-street, to Mr. R. A. Woodger, Seedsman, of Molesworth-street, who will in future carry on the same. HENRY BUDDEN. On the 11th November 1893, New Zealand became the first self governing country to give women the right to vote in parliamentary elections: Exercising her vote: Alice Woodger living at Molesworth Street, Wellington, Domestic duties. "R A Wodger, 3 and 9 Molesworth Street, has for sale the largest and best collection of pot plants in Wellington - over 3000 to choose from. Ferns in great variety; pot plants for hire. Cut flowers, bouquets, wreaths, &c., on short notice"
Richard Woodger now living at 7 Sussex Square, is again in financial trouble and in March 1899 he filed a petition in bankrptcy.The amount owing to unsecured creditors is ?168 6s lid, the largest being: Mrs. W Fisher, Otaki, £37 10s ; City Council (rates), £14 15s 6d, Commercial Union Assurance Co. £14 11s 8d ; Dr. Chappie £14 6s ; Captain Popham, £11; H. C. Gibbons and Co., £9 16s 9d ; Blundell Bros. £7 ; Hay and Son, £7; H. Budden, £6 14s 2d ; J. Thomas, £6 9s Id; Andrew Given and Co., £5 9s 6d. There is one secured creditor, the Metropolitan Building Society, to whom £194 4s lid is owing, and who holds a security (leasehold of three properties in Molesworth-street), valued at £300, leaving a surplus of £105. 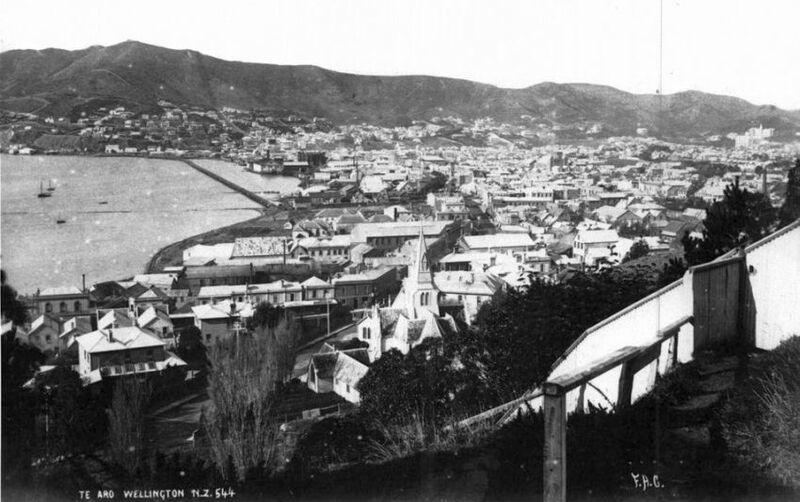 18 April 1899 In the bankrupt estate of R. A. Woodger, the Official Assignee calls for tenders for the purchase of the unexpired terms of certain leases in Thorndon. In May at the Bankruptcy Court, an order for discharge was granted. R. A. Woodger, seedsman, said he had had losses in business owing to the keen competition with Chinamen. He also lost his stock by a fire two years ago, and had no insurance. He was getting occasional work now as a carpenter. A discharge was granted. 2 ADA EVA* WOODGER, b. 22 Oct 1890, Owen St, Newtown, Wgtn; She died 1961, Sydney, NSW, Australia. Sadly, to date, no photos have yet been discovered to remember our Woodger family.